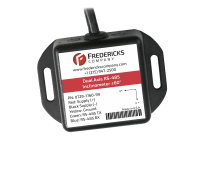 The 0729-1760-99 RS-485 inclinometer utilizes a Fredericks TrueTILT™ wide-range electrolytic tilt sensor and RS-485 signal conditioner. Its robust plastic housing and epoxy potting provide excellent durability and environmental protection. This inclinometer has superior tolerances and unit-to-unit performance. Its small profile and economic design make it an ideal solution for a versatile range of applications in all sectors. 0729 series inclinometers – These inclinometers utilize Fredericks TrueTilt™ wide range electrolytic tilt sensors. They have a variety of outputs including analog, RS -232 and RS-485. These inclinometers have a low profile and a robust plastic housing with epoxy potting to provide excellent durability and environmental protection. 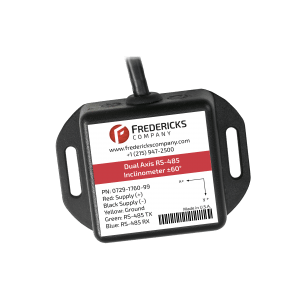 6200 series signal conditioners – These signal conditioners can be configured with any Fredericks electrolytic tilt sensor. They have a variety of outputs including analog, PWM, RS-232, RS-485 and SPI. The electrolytic tilt sensor and signal conditioner are provided separately or as an assembly with the sensor already installed at the customer’s request.